When UW-Madison chemistry lecturer Jeanine Batterton accused 42 students last fall of plagiarism on a written lab assignment in Chem 104, she was floored by the range of “bizarre excuses” offered by the undergraduates. Some contended that cutting and pasting information out of Wikipedia — the Web-based, user-generated encyclopedia — was OK because no single author writes the entries. Others argued that since the assignment was a group project, and since they didn’t write the part of the report in question, how could she punish them for any wrongdoing? One student even told Batterton that when he was caught copying homework answers in another class, the professor let him re-do the assignment — so why couldn’t she do the same? Welcome to the sometimes confounding topic of plagiarism in the cut-and-paste Internet era. While most seem to agree with the notion that plagiarism — taking the work of others and presenting it as your own — is wrong, everyone from national experts to professors and students say the vast quantities of easily accessible online information coupled with fuzzy definitions of intellectual property and common knowledge make this matter thorny. Many campuses are grappling with it. In June, UW-Madison’s Division of Student Life put Yolanda Garza in charge of starting a campuswide discussion on academic integrity. Although Garza insists no single event led to her new position, it’s clear what happened in Batterton’s Chemistry 104 course last fall played a role in pushing UW-Madison leaders to start taking a more systematic approach to the issue. Donald McCabe, a professor at Rutgers University and co-founder of the International Center for Academic Integrity, has been researching academic misconduct for 20 years and he says perceptions about what constitutes plagiarism are changing rapidly. In particular, surveys McCabe conducted between 2006 and 2010 showed that only 29 percent of college undergraduates believe copying from the Web is “serious” cheating. In the four-year period before that, 34 percent considered it “serious.” McCabe’s research also shows that between 2002 and 2009, of the roughly 75,000 students surveyed 48 percent admitted to engaging in some sort of written cheating — which covers everything from cutting and pasting part of an article to purchasing a term paper. A puzzled Downs asked the man what he meant. Cathy Middlecamp, the director of UW-Madison’s Chemistry Learning Center since 1989, says one of her most memorable cheaters was one who plagiarized from a widely used textbook, “Chemistry in Context: Applying Chemistry to Society,” which Middlecamp edits and helps write. But while everyone, even the plagiarists, agree on the line between right and wrong in those examples, Fishman says there are plenty of instances where smart people can disagree on what is, or isn’t, plagiarism. She has conducted numerous workshops for academics where she’ll ask a group to define plagiarism. Everyone can agree on the clear-cut cases, she says. As Ulmer’s comment suggests, the line isn’t quite so clear when dealing with a generation of students who have always had nearly unlimited access to vast amounts of information on the Internet, and who live in a world where downloading copyrighted music, movies, video games and software is common. To many, the idea that someone can own information or ideas or words seems outdated. “I really don’t think this is a plagiarism problem as much as it’s a problem of understanding what intellectual property is and how you evaluate to whom intellectual property belongs,” says UW-Madison English professor Michael Bernard-Donals. He notes that universal libraries, where extensive resources are available through a single database, have made enormous amounts of quality information available online in recent years. The director of the English 100 program for seven years, Bernard-Donals says he tended to see one or two cases of plagiarism per year in this writing-intensive course. And more often than not, the case involved a misunderstanding of what should or shouldn’t be cited. Blatant attempts at passing off someone else’s work as the student’s own were rare. 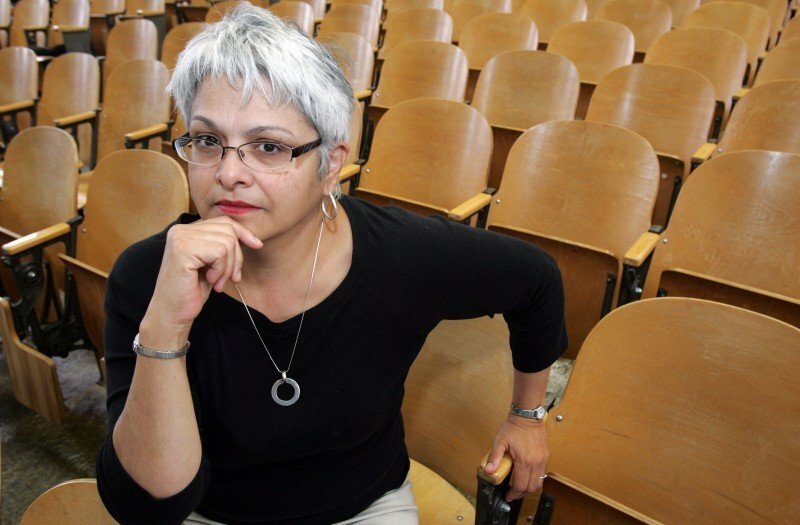 In an effort to start a campuswide discussion on the topic of academic misconduct and to more clearly spell out what is expected of students, Garza has spent much of the past three months meeting with hundreds of students and teaching assistants, plus key personnel in departments across the university. “The goal is to just send a message — from the time someone is a prospective student just considering UW-Madison to their days on campus — of our expectations as it relates to academic integrity,” says Garza. “And now we’re reaching out to different offices and parts of campus and asking them what kind of materials do they have available on their website and what are you saying about topics such as plagiarism? We’re really just trying to get people thinking and talking about this. Middlecamp, for one, was thrilled to learn the university was starting to tackle this topic with a campuswide effort. Garza is stressing to faculty and teaching assistants to be very clear about their expectations in regard to academic misconduct. While most faculty on campus have long inserted a few words on the topic of plagiarism in their syllabus, they are now being encouraged to do even more — such as giving examples in the syllabus of what is or isn’t allowed, and spending lecture time discussing the topic. Ulmer, the UW-Madison senior, agrees that that approach is probably needed. One thing that doesn’t appear to be on the table is having professors campuswide use plagiarism detection tools widely available online. Kevin Bargnes, a UW-Madison senior and the editor in chief of the daily campus newspaper The Badger Herald, says his newspaper has found several instances of plagiarism in recent years. In 2006, the Herald even fired an editor because he was lifting copy from the Associated Press and Milwaukee Journal-Sentinel, Bargnes says. Over the past few years, he says the Badger Herald has run all its articles through iThenticate, an online plagiarism detection service. “I always thought it was odd we spend the time and money to do that, but you don’t see that in academia very often,” says Bargnes, who estimates it costs the Badger Herald under $1,500 per year to use the service. The editor at The Badger Herald accused of plagiarism was fired from his job, but the range of punishments for UW-Madison students in similar circumstances is broad. Under the university’s code of academic misconduct, possible consequences for plagiarism include an oral reprimand; a written reprimand to the student only; a chance to re-do an assignment to be graded on its merit; a lower or failing grade on the particular assignment or exam; a lower grade in the course; a failing grade in the course; removal of the student from the course; a written reprimand to go into the student’s file; university probation for up to two years; suspension for up to two years; or expulsion. Lead instructors are supposed to spell out punishments after giving students a chance to defend themselves. If the students don’t think they’ve committed academic misconduct or don’t agree with the teacher’s punishment, they can request a hearing through the Division of Student Life. According to UW-Madison statistics for 2008-09, there were 91 incidents of academic misconduct that academic year — with 33 cases of plagiarism. In those 91 instances, 47 received a lower grade on the work, 13 failed the course and 13 received a disciplinary reprimand. No other sanction was used more than eight times. In Batterton’s Chemistry 104 course last fall, only a few were sanctioned in the wake of the lab report incident. Their assignment was to write a formal lab report including three references. This was a group project, with three or four students generally working on each report. Batterton says red flags popped up when teaching assistants started noticing the same sentence in a handful of the papers — and the students weren’t using quote marks or citations. A Google search showed the students had pulled the information off the Web. Out of the 350 students in the class, Batterton told 42 of them that they would receive a zero for the assignment, which accounted for less than 2 percent of the entire grade for the course. More than half, 26, didn’t think that was fair and received a hearing before a three-person panel that included faculty, staff and a student. Twenty-two of those were exonerated, while the panel found that the other four did commit academic misconduct. Asked for a response, Garza said she would not comment on any individual case due to confidentiality issues. Similarly, she said she could not make available the names of the committee members who heard the cases. Others contacted for this article across campus, however, seemed generally pleased with how the university handles academic misconduct cases. Batterton — who previously put a blurb on academic misconduct in her syllabus and provided a link to more information on the topic — says she plans to spend more time talking about the issue in the future if she returns to the classroom. She is spending the current academic year as the interim undergraduate chemistry coordinator. Batterton says the chemistry department is also considering putting together an online tutorial for students that would spell out what constitutes academic misconduct and plagiarism. A year later, the sting of the situation lingers, and Batterton wonders if charging the students with plagiarism was worth it. McCabe, the Rutgers prof, agrees this is an issue colleges need to take very seriously — but admits there are no simple solutions. Looking the other way, however, should not be an option.